Karg-Elert occupies a remarkable niche in the history of German music. He is best known for his compositions for organ and harmonium but this first recording of his complete works for flute, reveals a completely individual voice. The ground-breaking Sonata in B flat Op. 121 stretches virtuosity to the instrument’s limits, The Suite Pointillistique is exquisitely colourful and the Sonata appassionata romantically expressive. 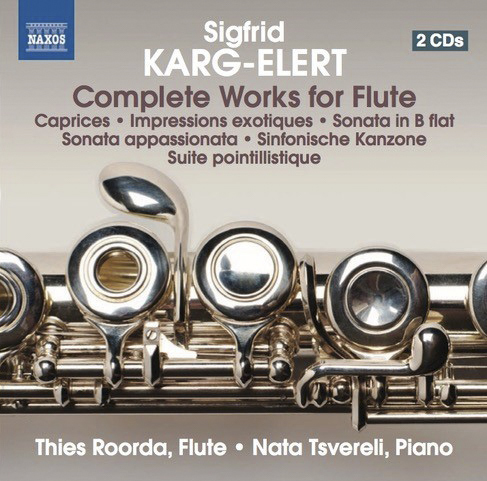 Each work, not least the challenging Caprices, reflects Karg-Elert’s kaleidoscopic imagination, and represents a significant body of music for the flute in the twentieth century.